Ryoichi Chida works at ART-HIKARI Co., Ltd., which manufactures resistance welding machines. As general manager of the Overseas Operations Division, he spends a great deal of time importing parts and exporting products. 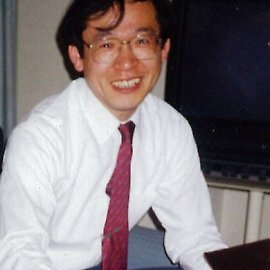 In addition, with the encouragement of other interpreters and translators, he voluntarily writes monthly essays about interpretation techniques, cross-cultural comparisons, and other things related to his business life and English-language career. He also acts as an English adviser to the International Affairs Department of the Ministry of Justice, as well as to engineering professors at the Tokyo Institute of Technology. Born in 1951 and brought up in a small coal-mining town in Hokkaido, he attended college in Kyoto and Tokyo, majoring in English with a particular emphasis on cross-cultural communication. He started his import-export career by working for a subsidiary of Sumitomo Corporation. He ran his own trading company for more than a decade before joining the current company. His favorite kanji is 無 (ム: the spiritual state of nothingness; transcendence) because he thinks that whenever he works at his job or serves as an interpreter, it's essential to be himself, maintaining 平常心 (へいじょうしん: one's self-possession; one's presence of mind; one’s composure) at all times and keeping his mind free and clear of outside distractions. The notion is somewhat similar to what the Chinese philosopher Zhuangzi called 木鶏 (もっけい in Japanese). This term refers to the mental state of a fighting rooster that always remains calm, as if it were made of wood. This rooster wins all its battles. Ryoichi's cell phone email address includes the term un-mokkei, “not 木鶏," which indicates that he isn't close to having become a 木鶏.